The European Union will not abandon its founding principles in order the facilitate a Brexit deal with the UK, its chief negotiator has said. 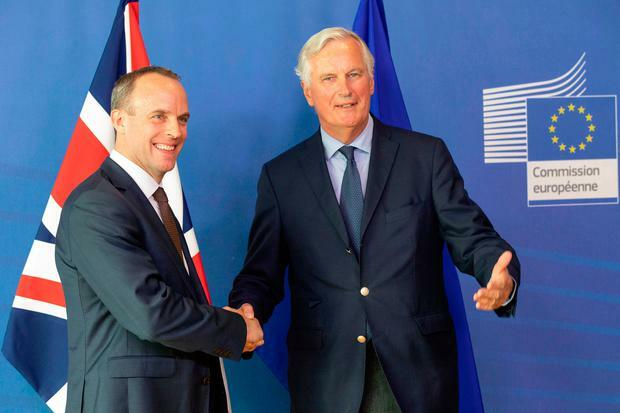 Michel Barnier said it was possible for the UK and EU to find “common ground” and create “a partnership that has no precedent” after meeting with Britain’s Brexit Secretary Dominic Raab in Brussels. But speaking to reporters alongside the UK cabinet minister he said that relationship had to “respect the single market and the foundations of the European project”. The speed of negotiations is to increase ahead of a self- imposed deadline of October to hammer out a deal. It comes amid raised fears a no-deal Brexit is becoming more likely as the deadline to agree a deal looms ever closer. Mr Raab admitted there were still some “significant issues” to overcome, including their future trade relationship and the Northern Irish Border. UK Prime Minister Theresa May’s Brexit blueprint, hammered out at a tumultuous summit in July, called for a “facilitated customs arrangement” between the EU and Britain plus a “common rule book” for trade in goods, with both already ruled out by Brussels. Asked why the EU seemed unwilling to give ground on its principles to get a deal, Mr Barnier said: “Why would we? The UK is leaving the European Union, it is not the other way around. “The UK is leaving and it is its choice and we respect that choice whilst regretting it. But the European Union is based on principles and values, on rules. “It is a whole ecosystem which is integrated of rules and laws and standards, of supervision and of certification… which the UK knows very, very well because we built it together, didn’t we? We have been building it over some 40 or so years together.